This post brought to you by GNC. All opinions are 100% mine. GNC started as the “General Nutrition Center” nearly 80 years ago in Pittsburgh as a place to go to live well and perform at your best. Today, GNC continues to help people beat average everyday with health and wellness products in addition to tips that will guide you along the way. GNC offers a wide range of products that can assist anyone on their Beat Average mission; such as vitamins & supplements, cleansing and digestion products, protein products and much more. It is said that up to 90% of Americans do not meet recommended intake levels for vitamins and minerals with food consumption alone. We all do our best to ensure we are eating a wide range of foods to meet our nutritional needs but doing our best doesn't always fill in those missing gaps in nutrition. Using multivitamins as a supplement will help fill the missing gaps of nutrients that you may not be meeting with food consumption alone. GNC has a variety of multivitamins that can be added to your diet, from prenatal health to joint health and everywhere in between! Each day I thrive to Beat Average by ensuring physical activity is part of my life raising three children. The kids and I hike a mountain every Summer, walk nature trails most of the year and enjoy playing tag every night in our home. Incorporating my exercise routine into family fun time really makes me feel as if I am Beating Average every day. GNC invites you to Live Well by simply living to Beat Average, know your proper nutritional requirements, be certain that your are taking care of your body. Drink plenty of water, have a daily exercise routine and be conscious of the foods you put into your belly. Together with your support, GNC wants to inspire others to Beat Average. 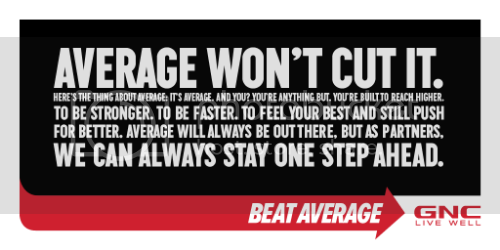 Share your #BeatAverage story today so as to inspire others tomorrow! Join #TeamGNC today and share your Beat Average story with the world! Connect with GNC Live Well via Facebook to keep up to date with the latest news and products regarding your health and fitness needs. Brandy is a born and raised New Hampshire resident who loves to spend extra time laughing & smiling with her three children. 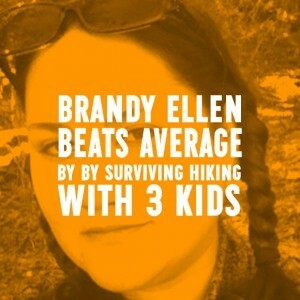 Brandy's life is captured daily over at HappilyBlended.com. Hi Brandy! Nice to be able to stalk you here, too! HAHA! Previous Post: Amazon offers $20 in Free photography apps for Android!